West Forsyth Junior Mason Ellis is certainly not messing around this indoor season. It's still extremely early in the season and most teams and top athletes have not yet competed, but Ellis has certainly put himself on the national stage already. 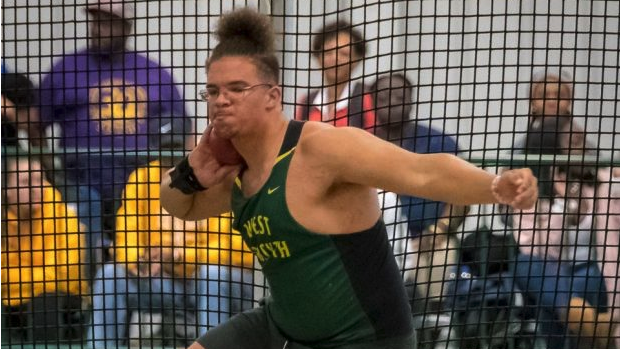 Ellis threw last week on Thursday Ellis kicked off his season with a Shot Put of 54-7 at the Forsyth Series #1. Ellis' best as a sophomore was 56-7 indoors and 56-2 outdoors. Just one day later Ellis returned to JDL at the JDL Distance Classic and threw a new PR of 60-3.5 improving on his already NC#1, US#1 mark. He becomes just the 5th boys ever to throw over 60 feet indoors and will be just 1 foot 6.5 inches off of Jon Beyle's (East Chapel Hill '13) Indoor State Record of 61-10. The Junior will have plenty of time to chase this mark over the next two seasons. The overall and outdoor Shot Put State Record is one of the states oldest set by Dennis Barron (Beddingfield) in 1982. Ellis and West Forsyth teammate Nathan Myers currently sit at US#1 and US#2 in the event. They'll have strong competition in 4A as Chancelor Crawford (North Mecklenburg) sits at NC#10 All-Time with his 57-11.25 from a year ago. He has yet to debut this season, but some major face-offs are certainly looming between these athletes. The state also returns 2018s 4A Indoor State Champion Timon Edelen (Wakefield) who beat Ellis by 2.25 feet a year ago. Ellis' mark is certainly one of the best November throws in US history.